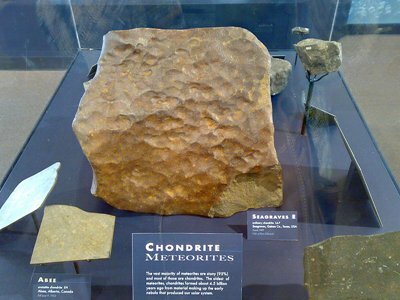 A chondrite is a stony meteorite that had been modified because of the melting of the parent body. It was formed when certain types of small grains and dust in the early solar system were not fully formed into primitive asteroids. It contains chondrules, which are free floating, molten droplets in space which are a millimeter in size. Chondrules are rich in silicate minerals called olivine and pyroxene. Over 86.2% of the meteorites that fell on the Earth’s surface were chondrites. There are different types of chondrites depending on their mineralogy, oxygen isotopic compositions and bulk chemical composition. Ordinary chondrites are the most common type of the meteorites that fall on Earth. They are generally abundant in chondrules and have variable amounts of Fe-Ni metal. They are further divided into H chondrite which is high in Iron content, L chondrite which has low Iron content and LL chondrite which has low iron and low metal content. Another type is the carbonaceous chondrite. It is enriched with refractory lithophile elements. There are also enstatite chondrites in which iron contents are formed into metal or sulfide rather than oxide thus making them high in the mineral enstatite from which there name is derived. Other rare types are rumuruti and kakangari chondrites which are dustier and has more oxygen isotopes.